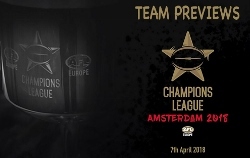 It is not long now until the prestigious AFL Europe Champions League tournament to be played in Amsterdam next month. AFL Europe’s website has featured a great series of articles looking at the clubs coming to Amsterdam for the event. The complete stories are to be found on the AFL Europe website, however the links to each article are include below. In our first round of team previews, we showcase two women’s sides including the highly acclaimed champions of the AFL London Women’s Premiership competition, the Wandsworth Demons, and the sole French women’s side the Bordeaux Bombers. We will also take a look at the reigning premiers of the Central European Australian Football League, the Zagreb Cvjetno Dockers from Croatia, the formidable Berlin Crocodiles from Germany and semi-finalists from the 2017 Champions League the Leeside Lions. In our second round of team previews, we showcase a new women’s side the Hamburg Dockers, who will become the first German women’s club to play in the Champions League, as well as the Odense Lionesses from Denmark before taking a look at three men’s teams in the West London Wildcats, the Lyon Lions and Croatian champions, the Sesvete Double Blues.